The London 1 oz Silver Coin is the second release in the Great Cities coin collection - featuring significant cities from around the world. The 1 oz fine silver coins in this collection are of a stunning contemporary-style design, combining engraving against a proof quality background. This London 1 oz Silver Coin .999 shows the impressive Big Ben in front of other iconic buildings from the London skyline. The coin is encased in an elegant themed box which slides open to reveal the coin nestled in a black velvet interior. The uniquely numbered Certificate of Authenticity sits within the packaging. Limited worldwide mintage of 3,000 coins - coin collectors don't wait, start building your collection today! 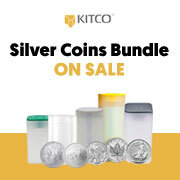 Buy your Great Cities- London 1oz Silver Coin from Kitco today! The New Zealand Mint has been minting legal tender collectible coins, gold bullion and medallions for more than four decades. As New Zealand's only precious metal mint and one of the first world mints to adopt the .9999 standard for gold coin purity, the New Zealand Mint prides itself on high quality design and production work.